Our end of summer SALE is still on and there are still many bargains to be had! The weather is still very good and you can still grab some of our summer clothing stock such as polo shirts and shorts at greatly reduced prices. Call in soon as this is the biggest sale we have all year and it will only be on until the end of September. "The fifth hole is one of my favourite holes at Hartford and it really can be a tough par three - especially from the back competition tee which involves a long carry over water to reach the green. I would say that the focus with your tee shot should be to hit the centre or even right half of the green, even if the pin is on the left don't go aiming straight at it as this line requires a longer carry over the water and there is also out of bounds just left of the green if you over do it. I want you to either pick a specific point behind the green to use as a target to aim at or pick a spot on the tee just in front of your ball along the target line where you want to hit your tee shot. I know that this approach has worked very well for world number one Rory Mcilroy who put his Open Championship victory down to a routine of a focus on a spot just in front of his ball along the line where he wanted his tee shot to start off. I know we all can't swing like Rory but there is no reason why we can't imitate his pre shot routine and his course management skills. 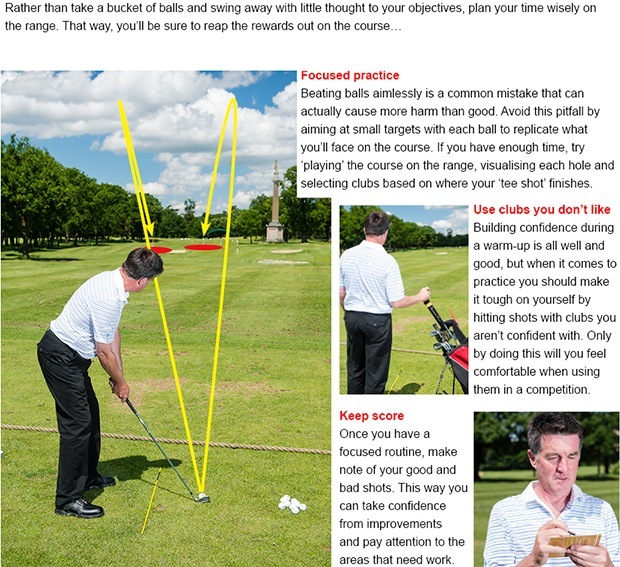 Try this approach next time you play and let me know if it improves your accuracy. When choosing what club to hit from the tee on the fifth I would always say to club up, if you end up short of the green there is water and a front bunker to catch your ball but if you do go a bit long through the green it's not the most difficult of chips back towards the green. Once you have chosen your club and picked your target spot commit to your shot!! The plan from the tee is to hit the middle of the green and if you do this you should never really have too long a putt. If you do miss the green with your tee shot make sure you either miss long or right of the green this will give you the best chance of chipping close to the flag. 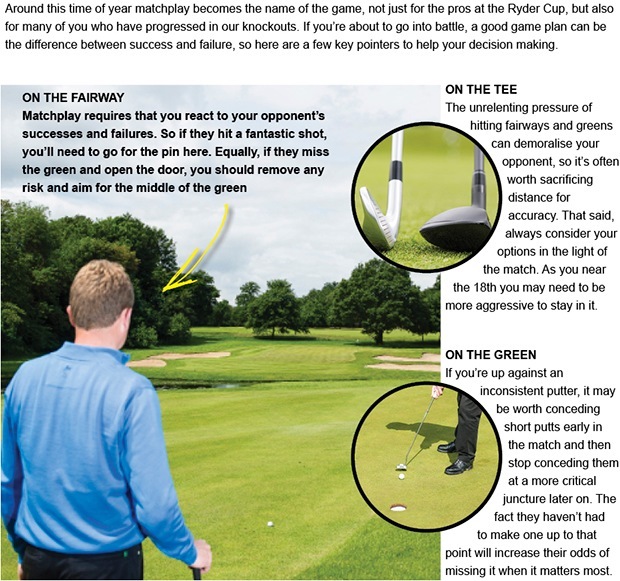 Remember the hole is a low stroke index so even single figure handicappers are expected to make a four more often than a three on this hole, the key is to avoid making a big score on this hole which you should achieve by following the correct strategy. When you finish the hole take a look back as you are walking away from the green this gives you a different view of the hole and it may show areas where you could improve your strategy the next time play, as ever please let me know how you get on." The Hartford Masters was played on Sunday and the winner was the in form Dave Johnson (below, left), he followed up his runners up spot in last week's Medal by firing a nett 67 to claim victory, this is the second occasion Dave has won the Masters and the right to wear our famous old jacket!! Dave played the front nine in just one over par, Ian Wardle (below, right) and Julie Danies finished second and third respectively both with nett 69's. The final of the I&J Daines Pairs Knockout Trophy was played on Tuesday afternoon and the winners were Tim Barnes and Steve Bond who beat the pair of Andie Fraser and Dave Johnson. The match started off closely with Dave playing some good golf, staying level par for the first seven holes, however Tim and Steve were dove tailing well together and established a one hole lead. As the game entered the back nine they established the upper hand but the real clincher was on the eleventh hole as Steve was looking in trouble through the back of the green in some little trees - he produced an unbelievable chip shot that went into the hole for a two when it looked like he would be making a four at best. From this point onwards Tim and Steve moved further ahead and eventually closed the match out by the margin of 5/4 - well played!! Good luck to Tom Duncalf and Gareth Eaton who are contesting the final of the LJ Percival Singles Knockout Trophy. Entries for the Winter League are now being taken, this is a pairs competition with an entry fee of £5 per pair , it would be great to see a good turn out for this ever popular competition and the course is always in great all year round condition meaning that you can keep your game sharp over the winter months. A special mention this week for our 7 handicap junior member Kieran Underwood who capped a fine season by making his debut for Cheshire under 14's at Eaton Golf Club on Saturday, he won his match in a 3-1 victory for Cheshire. He was also selected for an additional County coaching session on Sunday which unfortunately meant that he had to miss playing here in the Hartford Masters. Well done Kieran, keep up the good work! Well done to nineteen handicapper Alison Worall who won the Ladies Midweek trophy last Thursday with a score of 38 points, this is the third board competition that Alison has now won and she also took the nearest the pin prize. In second place was Margaret Cherry with 34 points and Kath Hough came third with 31 points, well done also to Sandra Peake who won the longest drive prize. The next ladies competition is an 18 hole Stableford next Thursday 25th September at 9am. The seniors played a yellow ball competition on Tuesday, the pressure of playing with a yellow ball got too much for some players as 5 out of the 8 teams lost their yellow balls! One team who managed to keep the yellow ball in play and win the competition were Paul Frost, Mike Eddison and John Sykes with 70 points. Next week the seniors play a nine hole strokeplay competition and they also have their final team match of the season at Pryors Hayes, so far they are unbeaten this season. Congratulations also to Geoff Dodd who won the seniors knockout trophy and to Bob Bowen and Rhett Butler who won the seniors pairs knockout trophy. Are you planning a golf getaway for 2015 but don’t really know where to start? 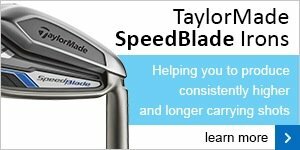 If you book now with our recommended travel partner, Golfbreaks.com, you’ll qualify for some superb cash discounts and FREE TaylorMade woods! It’s the Early Birdie, Golfbreaks.com’s biggest promotion of the year, and you wouldn’t want to book anywhere else.